Even those of us who haven’t been diagnosed with allergies breathe easier in a home with less allergens. 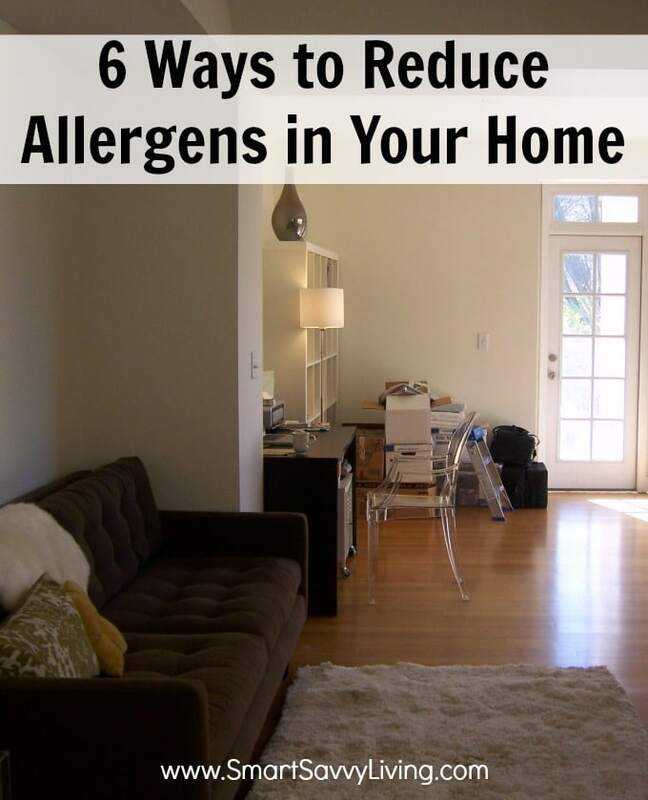 Check out these 6 ways to reduce allergens in your home. It seems like just about everyone has at least one allergy these days whether it’s dust mites or foods. Some allergies can be managed more easily than others, but it’s exceptionally heartbreaking when your home makes yourself or others literally sick. Whether you want to help ease allergies or just have your family breathe easier, these 6 ways to reduce allergens in your home can help. 1. Be mindful of when you have your windows open. Pollen is a big allergy for many and when you have your windows open, it can easily blow inside, even if you have window screens. Also be aware of activities your neighbors may be doing around the year such as smoke from grills and bonfires that may irritate your lungs. 2. Replace any carpeting with hard floors. No matter how much you clean your carpets, it’s very easy for allergens to get caught deep in the fibers and be nearly impossible to get out. That’s why it’s best to replace any carpeting with hard floors that are much easier to keep clean if allergens are a serious concern. 3. Purchase furniture that is easy to clean. Some furniture materials, like leather, are much easier to clean than others, especially if you have pets. You can also cover the furniture in slipcovers to clean regularly for a cheaper alternative. 4. Use easily washable window coverings. When’s the last time you’ve cleaned your blinds and curtains? I know I honestly have no idea! They can capture a lot of fur, dust and other allergens without really being able to notice. Use washable window coverings that are easy to take down and put back up to help reduce allergens in your home. 5. Take advantage of allergen-reducing appliances and products. With allergies being so much more prevalent these days, there are number of appliances and products you can use to help reduce them. Air purifiers will help reduce the number of allergens in the air, while humidifiers and diffusers can help moisturize the air to make it easier to breathe and essential oils can help you feel better and have antimicrobial properties. There are also air filters that can help circulate cleaner air when you run the heat or AC. 6. Regularly clean with high quality products. Allergens are a part of our everyday life whether it’s from our pets and even ourselves. That’s why it’s important to come up with a regular cleaning schedule and use high quality products that are made to help reduce allergens more efficiently. To me it’s extra important to do this as a cat owner with friends that we like to have over, but are allergic to cats. One of my favorite products that I’ve recently been trying out is the soon to be released Dyson Cinetic Big Ball Animal + Allergy. This new vacuum is the latest from Dyson and will be available at Best Buy starting March 1, 2015. What makes this vacuum even better than previous Dyson models is that it features Cinetic Science technology, which means they can spin out the finest dirt and dust allergens. In fact, it can capture dust that is so small, you don’t even need a filter and so you never have to worry about cleaning or replacing filters again. The vacuum is also supposed to never lose suction. I love that this vacuum comes with so many attachments – but don’t worry, it also comes with a bag to store them in! The thing I really love about this vacuum is that the cleaner head self-adjusts so you can go from carpets straight to hard floors and vice versa, without ever losing suction. I tend to vacuum a lot, especially our hard floors, because we tend to have a lot of fur bunnies. This vacuum honestly handles hard floors the best of any I’ve ever used, including previous Dyson models. A lot of vacuums tend to just kick debris back, but the Dyson Cinetic picks everything up from crumbs to cat fur with ease. It also is a lot quieter than most vacuums I’ve used. It also comes with several attachments so you can make sure everything from your mattress to ceiling fans are free of dust. What are some ways to reduce allergens in your home that you use? These are some great tips. I’ve always wanted to try Dyson products. I’ve heard some great things about their vacuums. Thanks, Katherine. 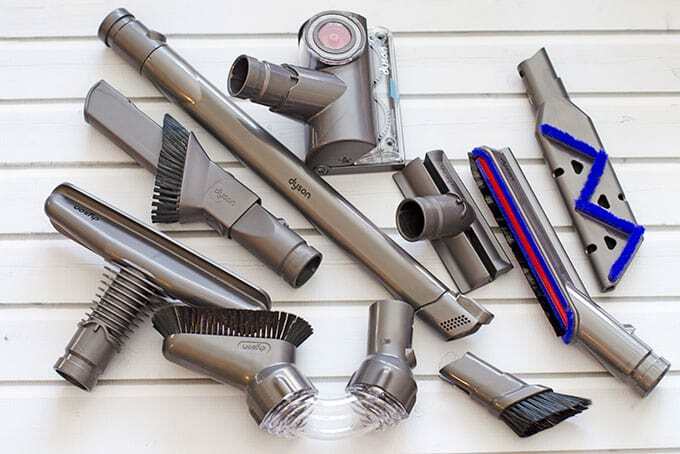 Dyson products can be a bit on the expensive side but I definitely think they’re worth it as from my experience they last for years. I used to have to buy a $100 vacuum every year just because they couldn’t stand up to all the cat hair and litter.